It seems that different personalities, especially regards to accessories, associated with a certain refinement level. For example elegant chic & classic seems accessories that associated with mainly level 1 or maybe 2. Relaxed person associated with refinement level 3 , or maybe 2. However everybody has life situation that involve various refinement levels. How can a classic-elegant chic, or a classic-dramatic dress down an outfit to level 3 that it fits their personality? Or how can a relaxed person do dress up an outfit to level 1? 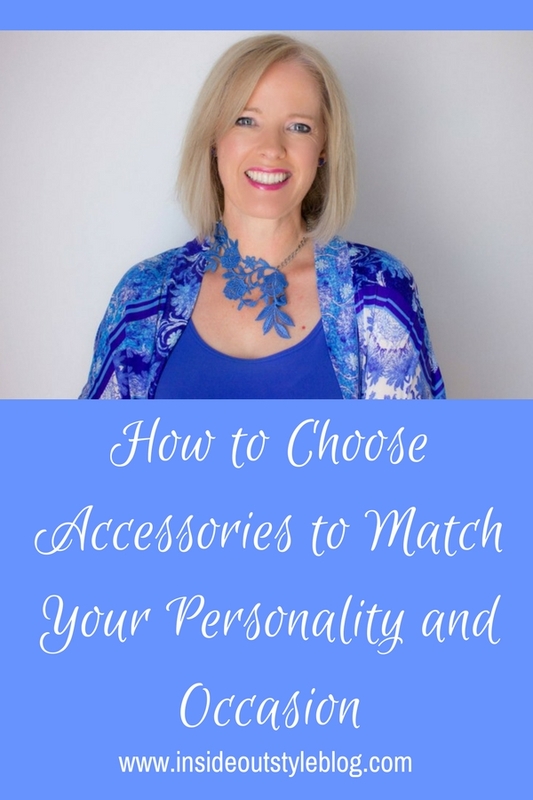 To answer these questions I’m going to delve into two aspects of accessory selection, the level of refinement and understanding the personality of accessories. 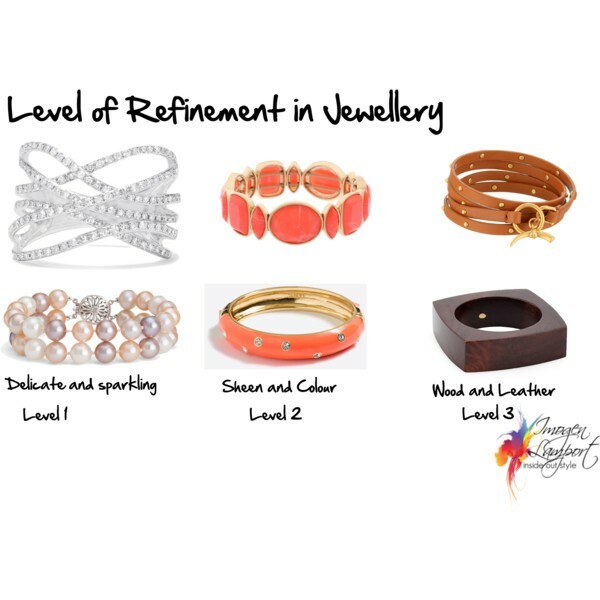 The level of refinement relates to the dressed-upness or dressed-downness of the jewellery and the outfit. For example, you would most likely mix sparkly with sparkly and matte with matte when putting jewellery together. This maintains the level of refinement and helps create harmony. That said, I think that we can all own a range of different styles of jewellery, made from different materials. None of us are one dimensional and so we don’t have to stick with just Classic pearls or Elegant Chic diamonds, or delicate and intricate Feminine bling. For any well functioning wardrobe, I’d be looking for a range of accessories in different materials, some dressier, some more relaxed, so that it’s easier to dress up or down your outfits. You are not a one-dimensional person, and neither should your wardrobe only be an expression of one personality dressing style. So let’s look at some examples. Here with this blue dress, you can dress it up with a more refined jewellery selection, or lower it’s level of refinement to level 2 by wearing a more colourful and less sparkly and delicate selection of accessories. When figuring out the level of refinement of any piece, consider the more delicate and intricate, the more sparkle, the higher the level of refinement. The more chunky and matte, made from natural or ‘raw’ materials, the more relaxed and lower the level of refinement. 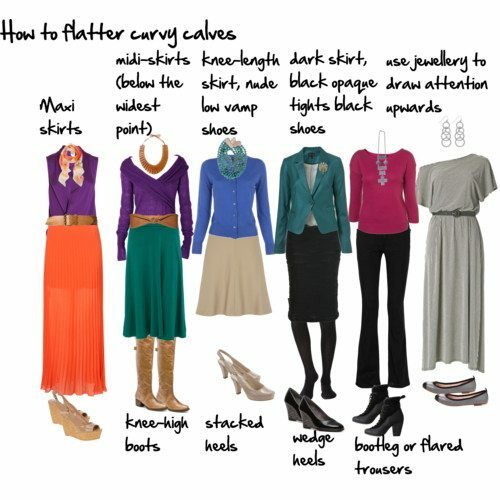 You can see by simplifying the accessories, by adding some ‘chunk’ you dress down an outfit. 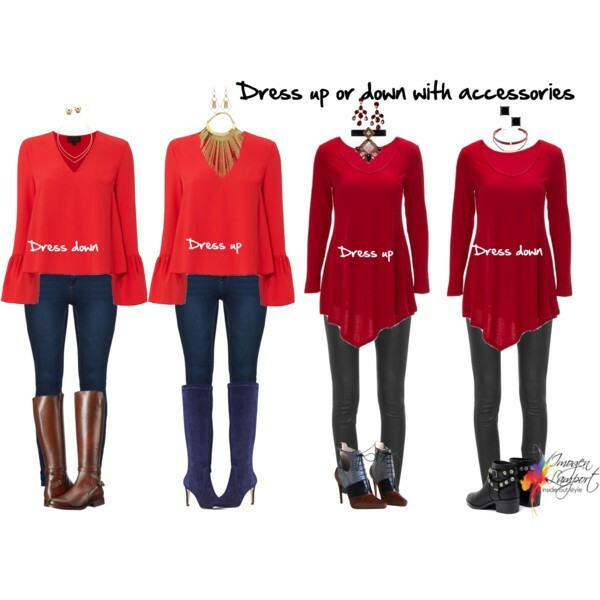 Want to dress it up? Add some delicate elements, more sheen, more sparkle and it will raise the level. Whether it’s the shoe (notice flats vs heels, slim heel vs stacked heel) or the details of any accessory, each elements adds to the dressing up or down of an outfit. Remember, this rule doesn’t just apply to jewellery, but to all shoes and accessories like scarves. 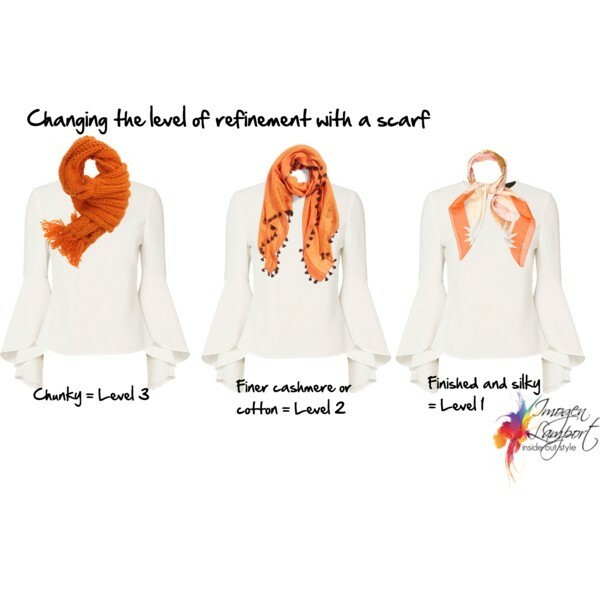 A silk scarf with a finished edge and some sheen is much more refined than a cotton scarf with a fringe or tassel, but that is still more refined than a chunky woolen knit scarf. A chunky level 3 scarf is less appropriate for work if you are office based. 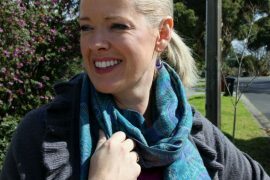 A fine silk level 1 scarf is less appropriate if you are out watching sport or doing other outdoor leisure type activities, or if you want to look more approachable and relaxed. Accessories change the tone of an outfit which is why they are so powerful in changing how an outfit appears and how it communicates (check out some of my posts on Yin and Yang which talk about how clothing communicate). Everything also expresses a personality element (or two). A Relaxed accessory will tend to lower the level of refinement, while a Feminine one may raise it, due to the materials and construction. Classic jewellery is smaller, more refined, not too much bling or detail. Relaxed jewellery is chunkier, made from more natural materials, more matte and has had less ‘processing’. Feminine jewellery is sparkling, delicate and intricate. Creative jewellery may be made from unusual materials, be asymmetrical, have a handmade appearance, or be made from materials you wouldn’t ‘expect’ to be put together. Dramatic jewellery is larger in scale. It may be brightly coloured. It has presence. Bold is the word I think of. Elegant Chic jewellery is made from quality materials, has some sheen, and also boldness. 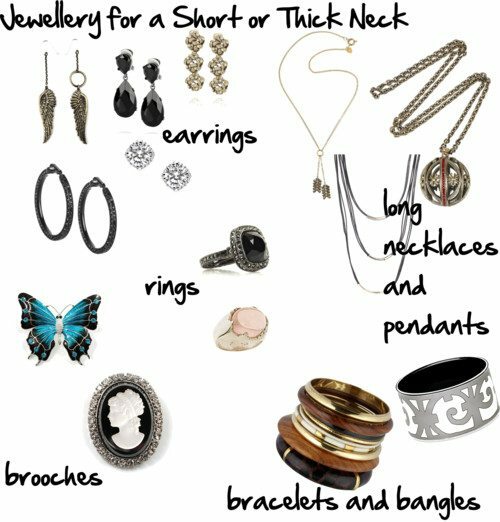 So when considering jewellery personality, you may want to express different elements of your personality with your jewellery. Notice how changing a necklace changes the feel of the outfit? I could wear any of these necklaces with this outfit. Which I choose will depend on what I want to express about my personality and the occasion. I see no reason to stick with only one type or personality dressing style of jewellery, so why should you? So if you want to change the level of refinement down to a more relaxed vibe (which is what you get with level 3 – which is what I otherwise think of as ‘outdoor leisure’), you’d want to either wear no jewellery, maybe replace necklace with a scarf, or if you were going to wear a piece of jewellery, it needs to be very unprocessed, such as made from wood, or leather, be chunkier, less delicate. Naturally those who have a dominant Dramatic dressing don’t enjoy wearing level 3 style clothing, as it just feels too dressed down to them (same goes for Classic and many Elegant Chic dominant people), but predominantly Relaxed people love dressing in level 3 clothing, and struggle with level 1. 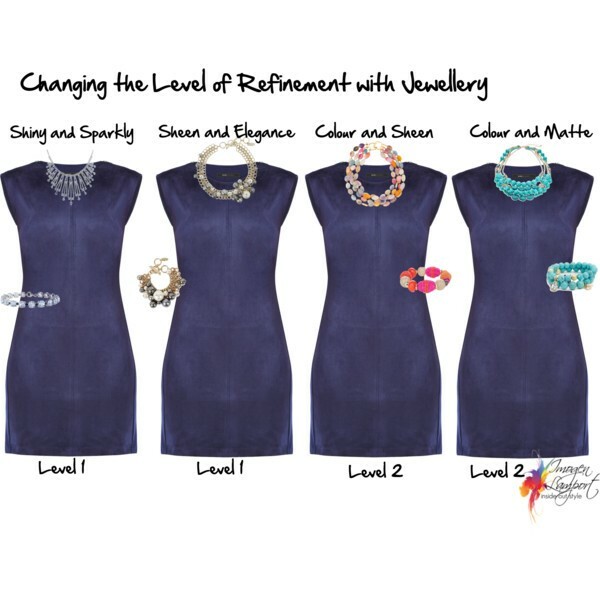 Wear your classic or elegant chic jewellery with your more relaxed clothing, and just accept that you will always look more ‘dressed up’, and be fine with it as it’s an expression of your personality. 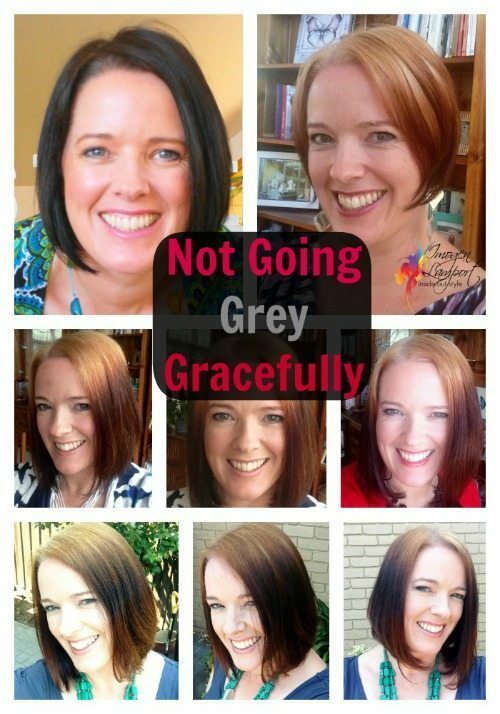 Next articleHow Do You Know if You’re Stuck in a Style Rut? Your description and visuals for level of refinement really touched on my inner struggles. Younger years were filled with level 1 and 2, elegant, chic, always easy for me. Now that I am retired (Yay!) I would like to to live an average day projecting casual, put together, chic. Thanks to you, I am going to do a through edit of accessories to help move me along with my goals!! I’ll still keep a few shinies just in case, Ha!! 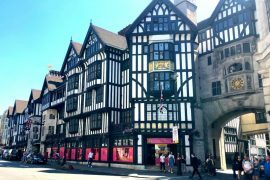 I’ve read all of your thoughts about this subject but this particular post is brilliant, clear and concise. Brilliant, Imogen!!! Over the years I’ve read all your articles covering level of refinement, but this is the best!! My earlier life was filled with level 1 and 2, elegant chic always easy for me. Now that I am retired (Yay!) I am striving to live level 3 but in a put together, casual chic manner. Today, I am going through the hundred scarves I own, mariad of jewellery items, etc. to help me achieve my goals, thanks to you!!! Great post! Your photos and descriptions of each refinement level really hit the nail on the head. I like the fact that you also talk about the multi-dimensional personalities we all have and the need to address this in how we put together our outfits.